Ford expands its EcoSport SUV range with the launch of a new entry-level petrol-powered version - the 1.5 Ti-VCT Ambiente. Doreen Mashinini, General Manager, Marketing at Ford Motor Company of Southern Africa (FMCSA), said: "The EcoSport has always offered a compelling combination of exceptional value for money matched to great style, upmarket features and family-oriented space and versatility. "With the updated range we set a new benchmark for the class once again, and the launch of the EcoSport 1.5 Ti-VCT Ambiente broadens its appeal even further by giving customers even greater value at the entry point to this popular segment," she adds. "Combined with the impressive performance of the new generation 1.5-litre three-cylinder petrol and the superb level of standard comfort, safety and convenience features, the EcoSport range is a more appealing proposition than ever," Mashinini adds. The 1.5 Ti-VCT Ambiente now kicks off the EcoSport range as the most affordable offering, followed by the 1.5 TDCi Ambiente which shares an identical level of standard specification, along with the five-speed manual gearbox. The award-winning 1.0 EcoBoost engine powers the mid-series Trend and range-topping Titanium models that are available with a choice of six-speed manual or automatic transmissions. Powering the new addition to the EcoSport range is a lively 1.5-litre Ti-VCT three-cylinder petrol engine that recently made its debut in the refreshed Ford Figo line-up. The 1.5 Ti-VCT engine produces 91kW/150Nm. Despite the new EcoSport 1.5 Ambiente being positioned as the entry-level model in the range, it is equipped with an outstanding level of standard features. The safety package incorporates Electronic Stability Control, six airbags, ISOFIX child seat mounting points, reversing sensors and manually activated ‘Follow-me-home’ headlights. A six-speaker Ford Audio system is provided, linked to SYNC with Bluetooth and Voice Activation, plus steering wheel audio controls. The instrument cluster incorporates a trip computer and an EcoMode that assists the driver to achieve optimal fuel economy. 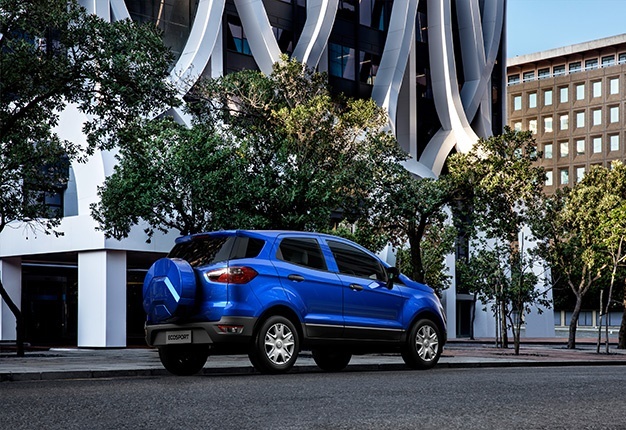 As with the rest of the EcoSport range, pricing includes Ford Protect which comprises a four-year or 120 000km comprehensive warranty, three-year/unlimited distance roadside assistance and five-year/unlimited km corrosion warranty. A four-year or 60 000km service plan is included, with 15 000km service intervals.